For Parrots is a coalition of parrot advocates & organizations working together for the betterment of parrots world-wide. This is a site for parrots. We want to keep parrots around for a long, long time. Currently, 1/3 of all parrot species are on the endangered list and may very well become extinct in our lifetime. For example, already there are localized extinctions of African Grey Parrots in Africa, the magnificent Spix Macaw is already extinct in the wild, there are only an estimated 80 breeding pairs of Orange-bellied Parrot left in Australia, and only 130 Kakapo parrots left in New Zealand. And this is only a fraction of what is happening to parrots right now. Habitat destruction, introduced predators and poaching for the pet trade are all decimating parrot populations. We are destroying the very thing that symbolizes our freedom and possibility: the free-flying bird. 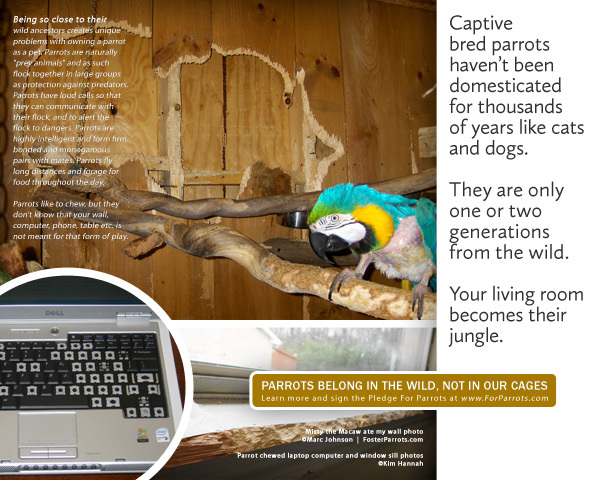 While the various organizations involved in For Parrots may have differing ways of going about their work, all have 2 things in common: (1) ultimately, parrots do not make good pets and should stay in the wild; breeding parrots for the pet trade is irresponsible and in the “big picture” does a disservice to the parrot both in the wild and as a pet. This may be a lofty goal, as there are many parrots currently in the pet system. As such, we do believe that if one becomes educated (and I mean truly educated and informed) about what it means to have a parrot in a human home, and pledge to provide a secure and parrot-appropriate environment for a parrot, then (2) adoption of a parrot is the only responsible and humane way to go. The posters on this site have been designed to share and to print. The license is a creative commons license (see below for details). The individuals who have provided the photographs for use in the posters maintain their individual copyrights. There is space left for you to place your own organization’s logo on the poster, should you wish to do so. Please don’t alter the posters in any other way. You can download, share and print these posters. You cannot alter them, aside from adding your organization’s logo. The full-size posters are 8″ x 10″.